"The most difficult part of installing the Push Button is taking it out of the box." 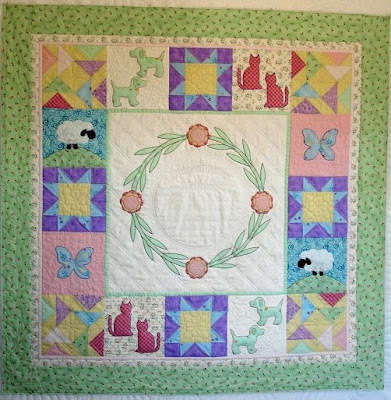 This is a quilt an expectant mother made for her baby to be born in a few months. The nursery will be a garden and nature theme. I thought lattice work would look good for some of the background, so I thought about it as I was lying awake in bed last night, and it came to me how I could do it. I determined I could use my Circle Lord Crosshatch Push button thingy. So I stitched every other diagonal line going one way, then I advanced the quilt the width of my hopping foot (1/4") and did the same lines again. Next, I stitched the lines (every other one) going the opposite way and did the same, advanced the quilt 1/4" and stitched again. And this is the result. I see one drag thread I hadn't clipped before I took this picture. I'm just so pleased that I figured it out. I've never done lattice crosshatch before. P.S. 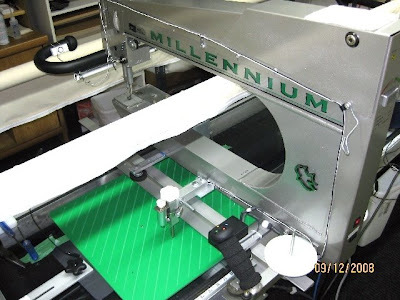 To find every other line with the Push Button, I would raise the stylus with the button, then lower and drag it to the next line, then raise it again and lower and drag to the second line, which I would stitch. You can hear the stylus click as it drops in a slot. For those that feel more confident crosshatching from the front, Circle Lord introduces the PUSH BUTTON CROSSHATCHING System. 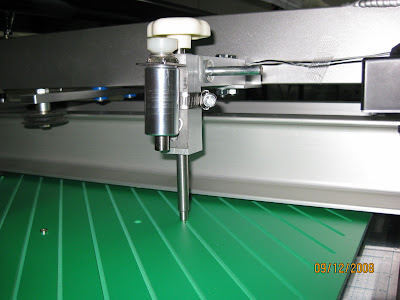 It consists of a solenoid attached to the stylus holder, that lifts, and drops the stylus, to move from groove to groove. The solenoid is wired to the push button switch that is attached to the front handle - see picture below. The system is powered by a small power supply, similar that is used by laptops. Just attach the solenoid to the stylus holder with the gear clamp provided, then, attach the pre-assembled wire harness using included plastic wire clips. Push the button, and the stylus lifts with an audible click. 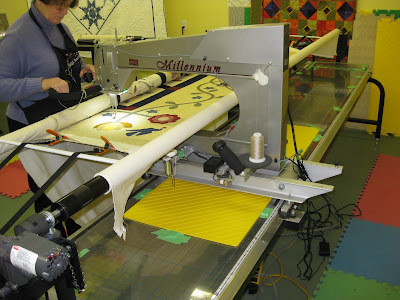 Let go, and it drops down to the template surface, and then drops into a groove, as you move the machine. Coleen mounted the Push Button system using the clamps supplied. Great War memorial quilt for the last living Canadian Veteran of this war. It will, eventually,be put in the War Museum, Ottawa. 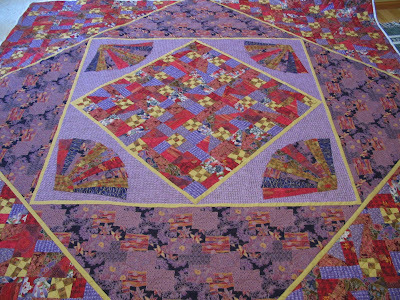 The Quilt was pieced by the Simcoe, Ontario Quilt Guild and quilted by Carol Cunningham. 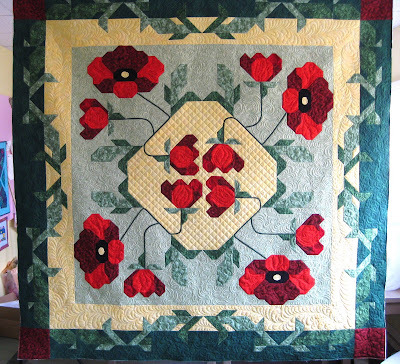 The theme is based on the poem In Flanders Fields where "poppies grow row on row". 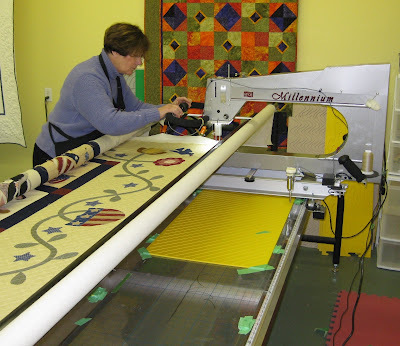 Carol Cunningham is crosshatching a large quilt with a lot of applique. 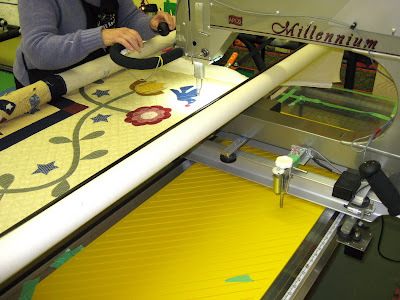 She stitches up to the applique and anchors the thread before jumping over the applique. Then anchor and move on to the edge, where she stitches in the ditch to the next groove coming back up. Just click the button on the handle to lift the stylus, let go and the stylus slides along the template until it drops into the next groove. 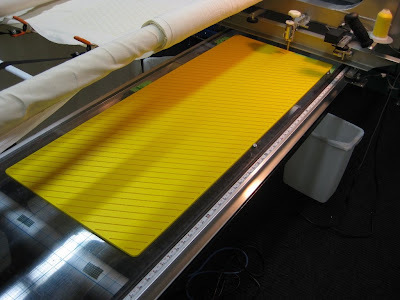 The template on is one of a pair of 48 inch diagonal templates. 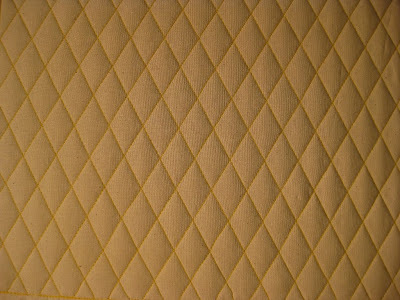 They are mounted on the table the same as the Zig Zag using small edge blocks taped down. This way you can slide the template easily to the next position. Just remove the left hand template and replace it with the right hand diagonal and do the crosshatch. You can use the 18 inch template mounted on the Circle Lord just as well, as shown at the beginning. The template has been slide down to the last position. The corners are taped each time to keep it in place. 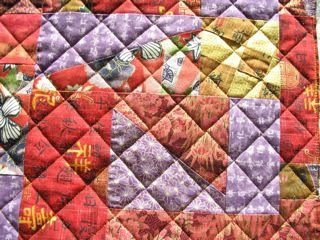 This is a closeup of the applique with the trailing threads laying across. They will be clipped later. 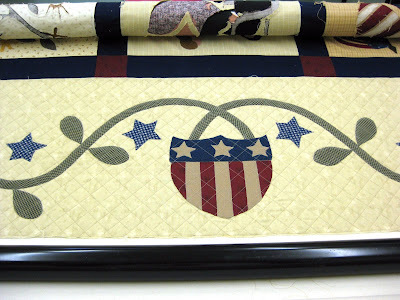 "War and Pieces" a Civil War Reproduction Sampler. 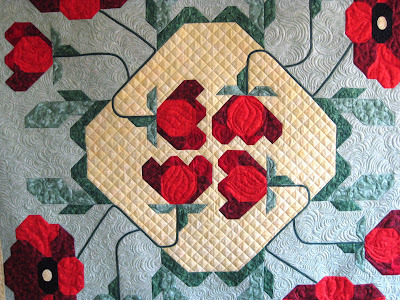 It is designed by Barbara Brackman, author of "Quilts from the Civil War" and Karla Carney Menaugh, and was published by the Sunflower Pattern Co-operative. 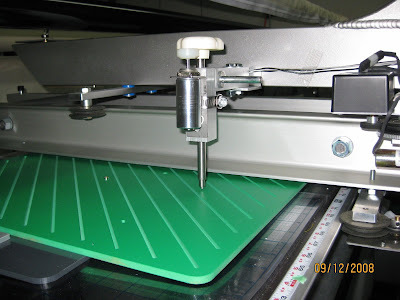 Pushbutton system will not work for stepping templates where you have to lift and turn the template. It will have limited use on some of the Giant templates, only if you do not need to see the pattern, or adjust anything from the back. On my rack now I'm killing two birds with one stone so to speak. 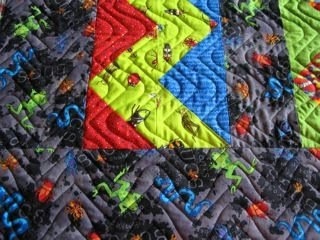 I have loaded one of the sample quilts I made quite awhile ago from a pattern called Treasure Boxes. 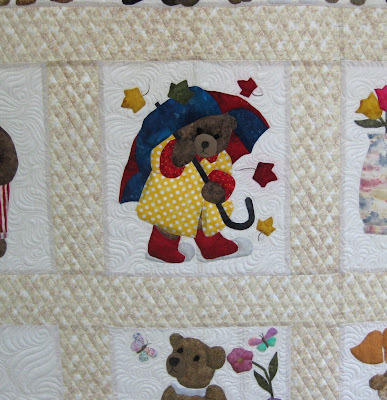 I actually taught this pattern to a class of beginner quilters. That was loads of fun and I wish I had time to teach. I found I actually liked teaching. Anyway I'm using this quilt for an online class and I'm also trying out the New Crosshatch giant template and Stylus Popper Upper from Circle Lord. 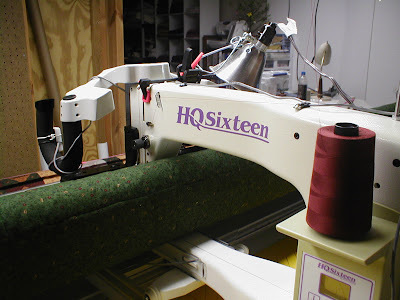 It's the first on-line Long Arm Quilting Class I've taken. I'm taking it at MQSolutions. The class is called Feather Boot Camp by Suzanne Earley who by the way authored Meandering Magic. We are into week two and I'm learning lots about the structure of feathers. I'm learning how to draw better looking feathers. Although my feathers looked ok before, there was lots of room for improvement. Hopefully I'll be able to fix and quilt beautiful feathers someday soon. So far I haven't quilted any feathers yet, I'll do that tonight. But I did get to try out my new CL Crosshatch template and popper thingy. 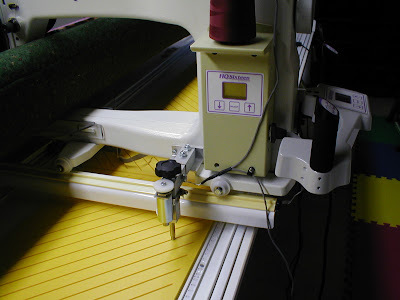 The stylus popper thingy allows you to stitch/quilt from the front of the machine. It seems to work really well and seems much faster. I think I'm going to like my new toy. I used my 24” square up ruler for the center and stencils for the rest, except the diamond crosshatching. I used my Circle Lord Diamond Crosshatch System for that, so I didn’t have to mark it. The only thing I had to mark was the center, as well as the little motifs in the four corners. 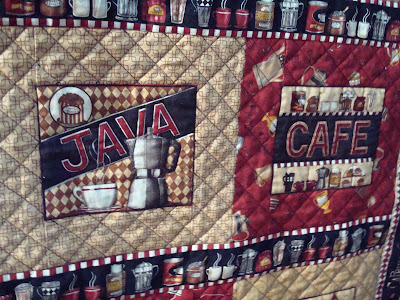 here is a quilt quilted by Carol Cunningham. She used the CL Push Button system from the front of the machine. It took her about 10 hours to do. 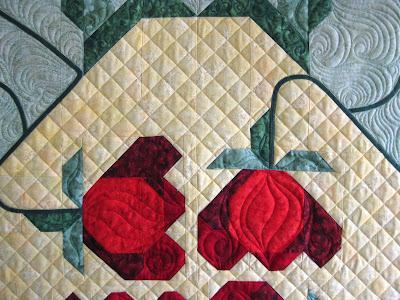 More details on the quilt will come later. About 10000 square inches. 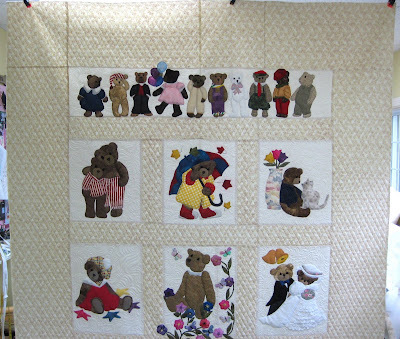 Most of the time was outline stitching the teddy bears, and Mctavishing. The Diamond Crosshatch template set is used in the same manner as the Crosshatch set (See next chapter). They can be used with the Push Button stylus from the front, or without, from the back. Below are pictures of the templates on the table, and a sample of the pattern. The basic diamond is 1" x 1.75"
Skip a groove and do 2" x 3.5"
The Regular Price is $149 plus shipping. This system will not work for stepping templates where you have to lift and turn the template. It will have limited use on some of the Giant templates, only if you do not need to see the pattern, or adjust anything from the back. Kathy Henderson send me these pictures of her unique method of using the 2 tools. 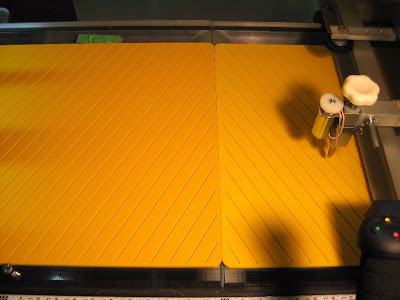 "Although the new tool was designed to crosshatch from the front of the machine, I expect to use it for a different application. 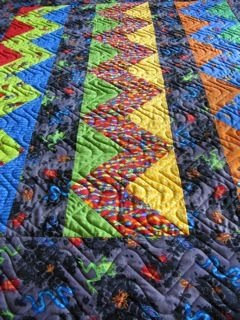 I will use it with the giant templates, when I want to stitch within some borders of the quilt, rather than edge to edge." 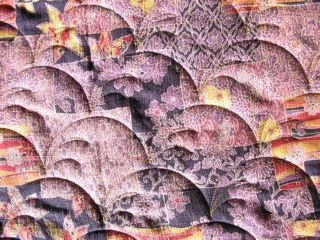 Both the ZZ and the Waves were used to make this pattern. Looks great! "This one is a simple kids quilt. Piggy backing off the quilt design and the fabric, I used the waves and zig zag vertically within the borders, and horizontally for the borders. 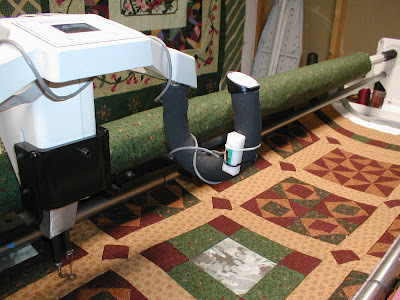 The new tool will allow me to stitch from the front down the border to the next row." 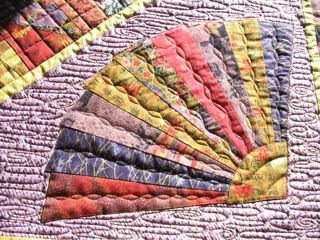 "For this oriental designed quilt, I used the zig zag to crosshatch the large center I freehanded and outlined the fan areas. 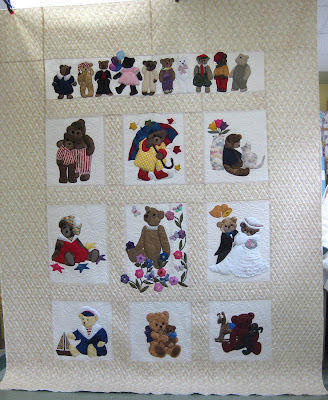 Just like the previous child's quilt, the new tool allowed me to stitch from the front down the gold border to the next row in the crosshatched and Clam shell areas."